McKenzie's style is rich and articulate. Each little detail in this novel is to be savored - from the description of Emma's dark mourning for her mother, to the details about the bitter cold she experiences on the east coast after returning home during the winter season. The heartache Emma endures throughout Forgotten is rightly expressed through McKenzie's sullen and morose tone. The story of Forgotten is really stimulating and makes you ponder about how you would personally handle Emma's situation. What would you change about your life if you learned you were presumed dead? You could really start over if you wanted to, and even cut people out of your life by having them believe you were still dead! Emma, however, is a strong woman who knows what she wants, and returns to her law firm to continue pursuing a long and fulfilling career in law, despite being forced to take a step back and work hard for the tenure she lost while in Africa. McKenzie writes romance smartly without any of the cliches we've read over, and over again. Emma's relationship with her boyfriend from before Africa fizzles appropriately without over-the-top dramatics, and a romance is allowed to blossom lightly with the man who has moved into her apartment. Additionally, the ending of Forgotten is sweet and subtle, without any predictable cliche faux pas. For the first time in a long time, Forgotten completely stunned me in regards to making me wish there was more to the book. At a full 420 pages, I was left wanting more of Emma's story. I can only imagine that McKenzie's talent will grow as she continues to release novels. I can't wait to read more by this author! Catherine McKenzie has also written Spin and Arranged. Her writing style reminds me very much of Cecelia Ahern, who has written P.S. I Love You, and There's No Place Like Here. What are your thoughts about Catherine McKenzie's books? Have you ever read Cecelia Ahern, and if so, what were your favorite books? Share your thoughts with us in the comments section below. I really loved Arranged, and am now definitely looking forward to reading this one! Sounds pretty awesome. Hi Allison! Forgotten definitely IS awesome. 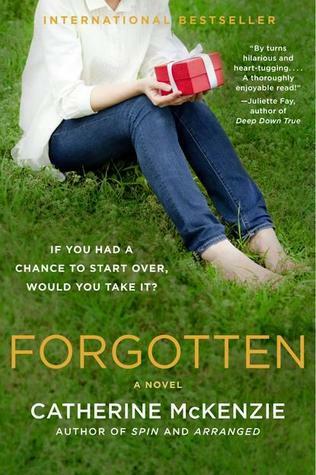 If you liked Arranged, you'll really love Forgotten. All of Catherine McKenzie's future books are going on my wish list, indefinitely.